We were invited to a Shopping day and were given an outfit to review. All opinions are 100% honest and our own. A little backstory, True Religion is an original brand that emerged in Los Angeles in the year 2002. I remember seeing all the kids and adults wearing their thick stitched jeans with that good ol' "horse shoe" logo on the pockets. The brand is actually very well known for it's amazing five needle thread at two stitch per inch process and for their Super T stich in the denim industry. 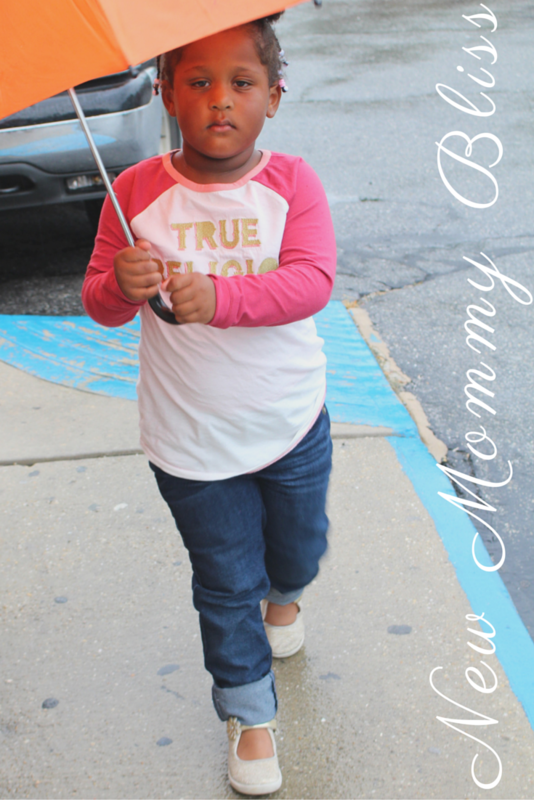 It was a rainy day today, but the style we chose still shined through. With the raglan tee's lovely colors and coordination, my kid was easy to spot while we were out and about. The dark "Bluelicious" shade of the denim was an amazing color style that the brand chose to create because they know kids get dirty no matter what, so the jeans can actually hide a little something. As you all may know, Gabs is an extremely tall 3 year old. Many people often confuse her for a 5 or 6 year old and I scream inside. Realistically there is nothing I can do about her height, but I HAVE to make sure I get her the right sizes in her clothing. I was very surprised with the stretch of these jeans! I've settled on ONLY getting my daughter jeggings or leggings so the stretch of these were a very big deal. The size 8 jeans with size 6 shirt fit amazingly and she still has space to grow in it! Noticed the rolled up sleeves and Rolled up jeans? I love that it doesn't take away from the style, but in fact creates a new one! True Religion kids is surely a brand I'm willing to invest in for quality outfits! Seeing their collection, True Religion has absolutely fabulous fashion items. Their attention to detail like how they choose the dark shade of the denim with the reason you've mentioned (kids get dirty no matter what) is really attentive. BACK TO SCHOOL - it's officially here! I won't lie, I am so so so happy I am no longer in school, lol! WOw what a cute outfit. Your little one is adorable but she doesn't look too happy about going back to school. This is beyond adorable! She is def owning True Religion. They have the most adorable clothing ever! I might just have to see if they have any deals going on?! I only just heard about this brand,never heard of it before. Looks amazing and so cute. I didn't even know that True religion made clothes of kids! They are so cute and diverse too. I wonder if my son is big enough for them yet?! She is tall! I love the new styles, the rolled up jeans. 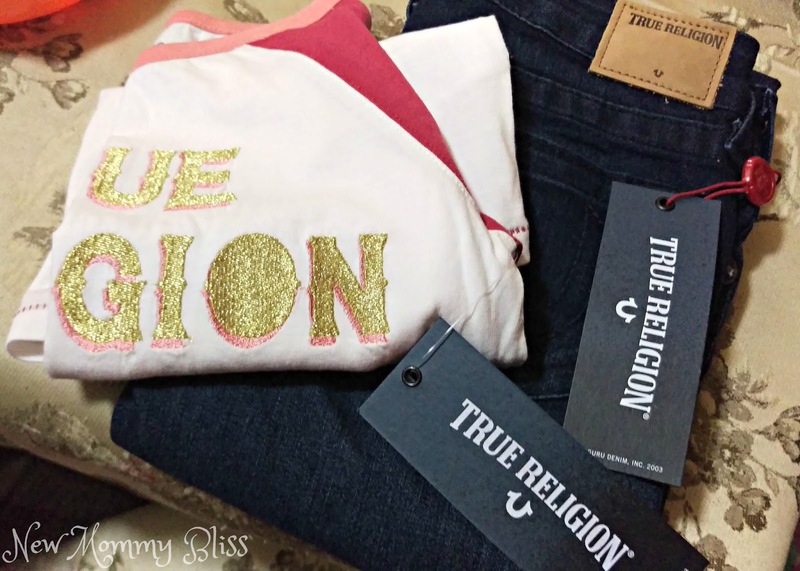 True Religion has some darling things! I haven't checked this out before. I need to look into this for my daughter's school year. So cute. My little girl will only wear leggings too. Maybe I should try True Religion jeans on her. Sometimes denim is so cute that I want her to wear jeans too. I had no idea that True Religion did kids clothes. I love the rock-punk vibe of the collection and she is defo owning the swag look. I had no idea they even had a kids section! I am definitely going to check them out. Thanks for sharing! Nothing like back to school shopping! 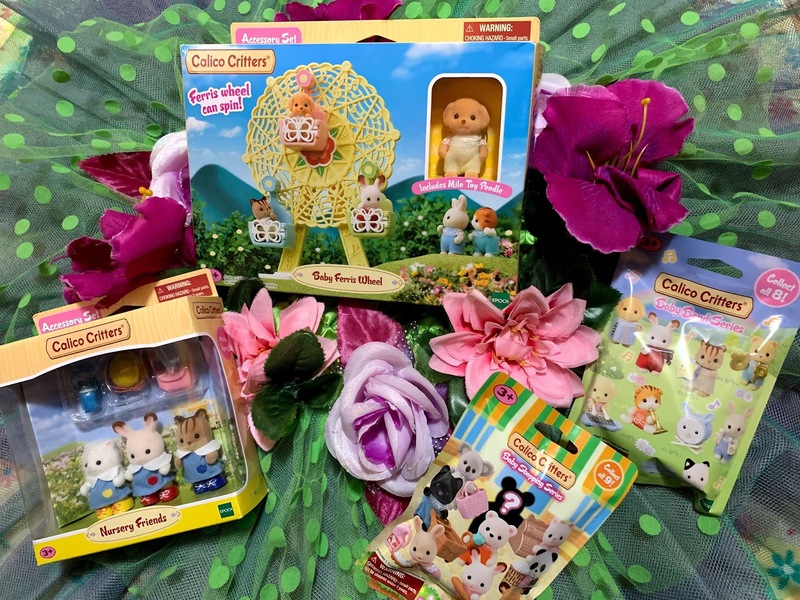 This brand has adorable choices for kids and it's really something that I would go for because the clothes look super comfy! It looks as though True Religion has a great selection and good quality. That would be great for back to school shoppers. LOOOOOVE back to school shopping for everything! Pencils to outfits! All of it! How fab that True Religion does kids clothes! So cute! I love that little outfit and your daughter works it! I'll have to check out this brand for my daughter. I had no idea they made kids' clothing. 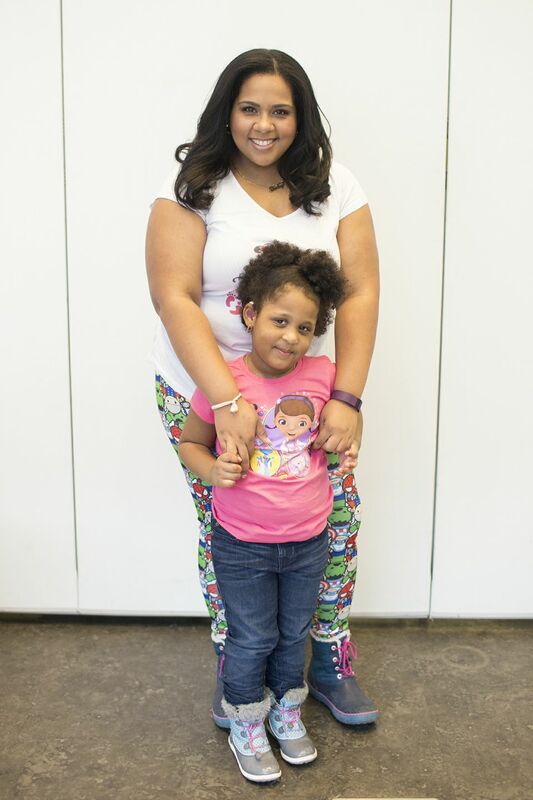 I can't believe she is a sz 8 and 6 already! woohoo what a cutie! This clothing line is so adorable! Everyone is showing off their favorite brands and they almost always feature little girls and they are so adorable. I am glad to hear that this brand offers great quality clothing and she looks like she is rocking her style. I've noticed that those graphic t-shirts are so popular this year! I've always loved True Religion and it's great that there's a kids line available now too. Your daughter is adorable! 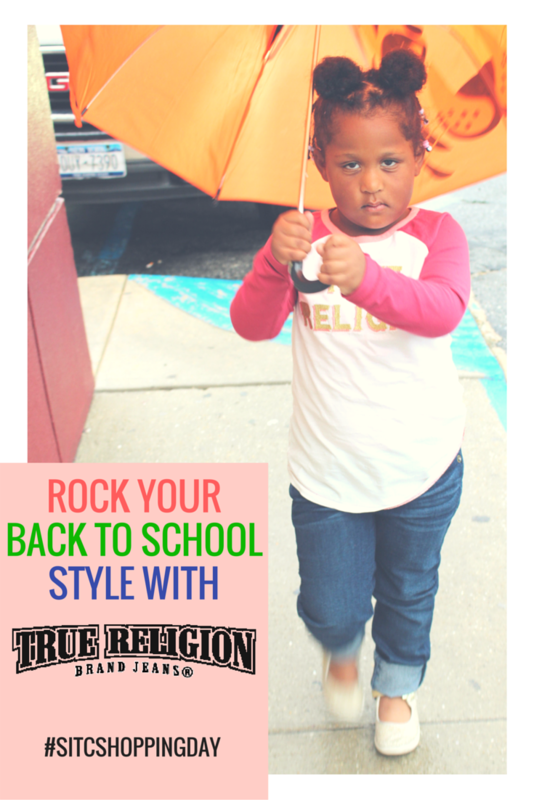 I've always loved the style selection that True Religion has for adults but I'm loving their kids' line as well. It's very stylish and modern. I had no idea they offered kids styles! I love her outfit and her diva look! My girl only wear leggings and sparkly shoes! Loving the new clothes coming out for school for me to looks at! These are adorable and one of the things I love about back to school is all of the new clothes and school supplies!! I didn't realize they made True Religion for children, but that's wonderful to hear! I love the pieces that you opted for. I didn't know True Religion has a kid's line of clothing. Great styles to choose from. She's seriously the cutest, and I love me some True Religion! I need to start having babies so I can dress them up all cute, LOL! I can't believe back to school is upon us already, but they've had a long break so time to work! I love True Religion and these outfits are the cutest! I love dressing up little girls but the best part is they have cute stuff for boys! Omg I had no idea true religion had kids clothes!!! I'm obsessed with there jeans!!! Will have to check there kids stuff out! My kids are the same way and the traditional sizes never match with their ages, I am glad these jeans have extra room in them so they will last them more than one season. I've always loved the jeans, but that top is the cutest!